I can't believe it is already a third of the way through July. Amber and I agreed to start back to school on August 1st, in an attempt to move closer to year round schooling. We probably will still take June and July as our official summer break, but continue with a few subjects even during that break. This summer Amber has alternated math and history every week day, with a few exceptions. I know it's going to be hard to start back to school this year before most of Amber's friends. However, we have the advantage of taking breaks whenever we need them, and not on preset schedule. It's also been so hot here this summer that we have been stuck inside most of the time, lamenting that we can't go do fun summer things. Perhaps we can school through the heat and take a break when the weather turns nicer. 1. Our Summer Ordeal is Over - If you read my last few posts, which have been sparse, you know that my husband nearly died in May and spent quite a bit of time recovering. He is now back to work and our school break is almost over. The beginning of the school year will mark a more normal time for us all. Everyone back to their regular schedule. 2. We Chose the Curricula - For good or bad, we got to choose the curricula ourselves. Last year was a fairly unexpected and quickly begun start to homeschooling. We simply continued using, for the most part, the curricula that Amber had in her parochial school. This year we selected curricula that will better fit our needs. 3. The Civil War - I LOVE to study the Civil War and Amber has never done so. I can't wait to be the one to initiate her into this time period. Living in Missouri we do have quite a few Civil War historic sites. I hope that we can make some field trips to those locations. 4. Music - With everything that happened with my husband, we let piano lessons slide for the first 6 weeks of summer. After that, I decided we would just wait for school to start again. No need to force more into our already crazy summer. Amber will also start back with the church's chimes choir. She so LOVES to play chimes. 5. Return to Routine - Amber and I both are driven by routine. We flounder and don't get much done without it. This summer we found ourselves sleeping later and staying up later. It makes it really hard on days when we need to be somewhere before Noon. We have also been eating not so nutritious meals at random times. Getting back to the school day schedule will be good for everyone. 6. 4 Day School Week - We are going to try a Monday through Thursday school week for the majority of Amber's subjects. Friday will be our day for catching up any subject that was skipped due to a random appointment, and for special topics and projects. 7. Art Appreciation - Amber and I are both pretty inept in the art department. However, I LOVE to learn about art - paintings, architecture, sculpture, etc. I hope that Amber will enjoy it as well. This year we will be alternating actual art projects with art appreciation. We will also try to make her art projects more than just the crafts that she already enjoys. 8. Fall Dance - Amber is terribly excited to start dance this fall, eventhough she has taken 2 classes over the summer. 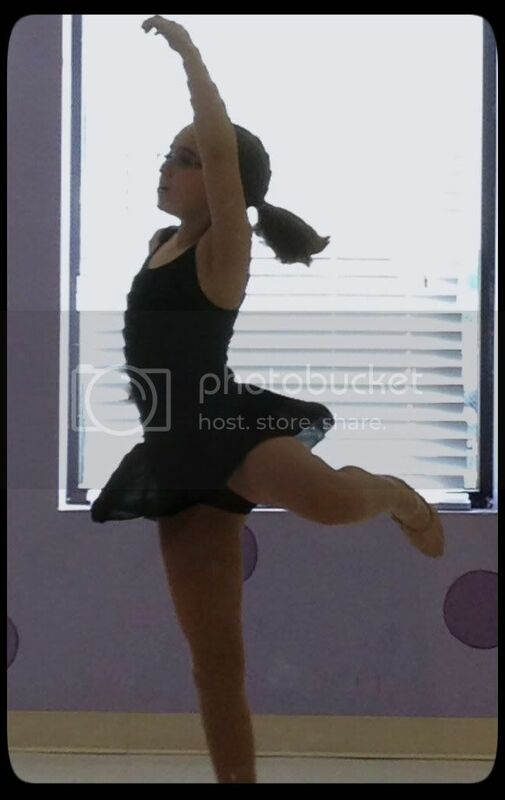 She has grand plans to take Ballet/Lyrical, Jazz/Tap, Leaps & Turns, her very first private dance lessons (with a solo at recital), and possibly hip-hop or contemporary dance. She can't wait! I'm a little more apprehensive and just hope we can manage to schedule these classes on only a couple of nights. A good friend may be switching to Amber's dance studio too, so that makes it all the more exciting. From summer Leaps & Turns class. 9. New Religion Curriculum - We have been so unimpressed by the religion curriculum used in Amber's parochial school. I was even more disappointed by the offerings for homeschool use through the Lutheran - MO Synod publishing house. I did finally find and purchase what looks to be a better solution from Lutheran Wisconsin Synod (and I'm just about over my guilt about this too). We are both actually excited to use it. It will be nice to not go through the weird attempt at "everyday applications" that the MO-Synod curriculum includes. 10. Setting our Own Schedule - I can't wait to be able to announce we are taking a break when Amber starts to get burned out. It will be nice to not have to push through those times, like we did in parochial school, or even last semester when we started homeschooling. I don't have to wait for a specific time, we can just decide as we go along when we feel the burn out coming. I'm also excited to try a few new things this year for myself personally. I very much want to write software again. I really miss working through the design, writing the code and creating a finished product. My poor comp sci degree is starting to get dusty. However, I know it isn't feasible for me to return to work right now. Not even a work from home job, like I had when Amber was young. I can be a bit of a work-a-holic and it's not fair to Amber for me to try adding a job while homeschooling. But I might just start developing software again, for myself. My husband has even offered to buy my first Mac computer so that I can write iPad / iPhone apps, without the deadlines created by a paid job. As I read your posts today, I was struck by the hard path we've both walked in recent months. What a tremendous blessing your husband has recovered the way he has. Hi, I am a new follower of your blog. I grew up as an only child but was not homeschooled. Now I am a high school English teacher, mom or 4 (3 already grown and gone) who always wanted to homeschool, but never did. I guess that is why I am so interested in the blogs that describe the homeschool journey. I am also have a daughter named Amber, my oldest, now 31. Looks like you have some interesting things going for the coming school year. I salute you for homeschooling. I look forward to following and reading more of your posts. It is good to hear that your husband is recovering. Have a good weekend. Thanks for following, I hope you enjoy reading about our school adventures. We are looking forward to this year. Have a nice weekend, as well.